Maps showing volcanic hazard zones on the island of Hawaii were first prepared in 1974 by Donal Mullineaux and Donald Peterson of the U.S. Geological Survey and were revised in 1987. The current map divides the island into zones that are ranked from 1 through 9 based on the probability of coverage by lava flows. Other direct hazards from eruptions, such as tephra fallout and ground cracking and settling, are not specifically considered on this map; however, these hazards also tend to be greatest in the areas of highest hazard from lava flows. The Big Island of Hawaii is divided into zones according to the degree of hazard from lava flows. Zone 1 is the area of greatest hazard, Zone 9 the least. 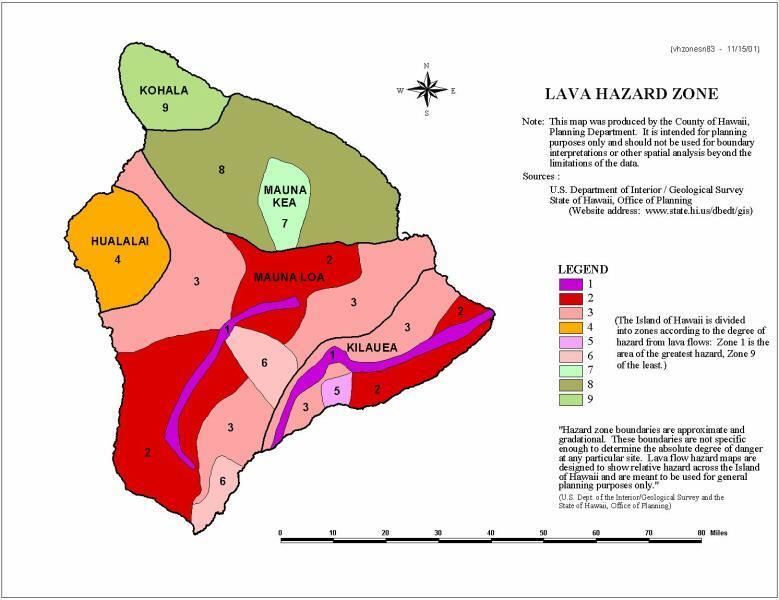 Hazard zones from lava flows are based chiefly on the location and frequency of both historic and prehistoric eruptions. "Historic eruptions" include those for which there are written records, beginning in the early 1800's, and those that are known from the oral traditions of the Hawaiians. Our knowledge of prehistoric eruptions is based on geologic mapping and dating of the old flows of each volcano. The hazard zones also take into account the larger topographic features of the volcanoes that will affect the distribution of lava flows. Finally, any hazard assessment is based on the assumption that future eruptions will be similar to those in the past. Includes the summits and rift zones of Kilauea and Mauna Loa where vents have been repeatedly active in historic time. Areas adjacent to and downslope of active rift zones. Areas gradationally less hazardous than Zone 2 because of greater distance from recently active vents and/or because the topography makes it less likely that flows will cover these areas. Includes all of Hualalai, where the frequency of eruptions is lower than on Kilauea and Mauna Loa. Flows typically cover large areas. Areas currently protected from lava flows by the topography of the volcano. 20 percent of this area covered by lava in the last 10,000 yrs. Only a few percent of this area covered in the past 10,000 yrs. No eruption in this area for the past 60,000 yrs. Hazard zone boundaries are approximate. The change in the degree of hazard from one zone to the next is generally gradual rather than abrupt, and the change can occur over the distance of a mile or more. Within a single hazard zone, the severity of hazard may vary on a scale too fine to map. These variations may be the result of gradual changes that extend across the entire zone. For example, the hazard posed by lava flows decreases gradually as the distance from vents increases. There may be abrupt changes, however, in the relative hazard because of the local topography. For example, the hills behind Ninole stand high above the adjacent slopes of Mauna Loa and consequently are at a much lower risk from lava flows than the surrounding area, even though the entire area is included in a single zone. To determine the hazard differences within a single zone, more detailed studies are required. The Big Island of Hawaii is an active volcano, with some areas of the island considered to be at higher risk than others. The East side of the Big Island has ongoing activity in the Volcano National Park area. Some areas of the island are considered to be "low-risk" with no active volcanic activity for hundreds of years, and none predicted in the indefinite future. Remember - no place on earth is guaranteed to be safe. Every area of the planet has its own risk factors including tornadoes, earthquakes, floods, tsunamis, hurricanes, etc. You have to decide where you choose to live, and what natural risk factors you're willing to accept.